She Kills Monsters playing at the Fox Egg Gallery in Minneapolis. 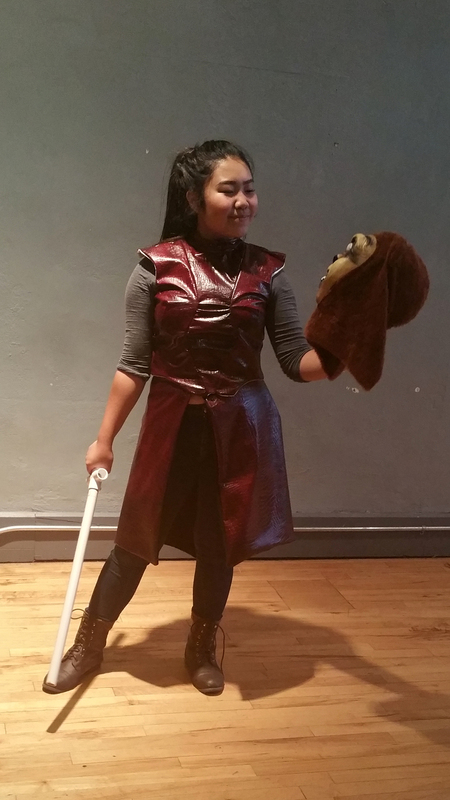 I didn’t know what to expect when I decided to attend opening night of Gadfly Theatre Productions’ rendition of Qui Nguyen’s She Kills Monsters, performed at Gadfly’s new space in the Fox Egg Gallery and directed by Immanuel Elliot. The basic premise is that when Agnes’s much younger sister dies, she discovers things she did not know about her sibling via a Dungeons & Dragons notebook she left behind. But I quickly realized that it is about much more than a girl who plays D&D. 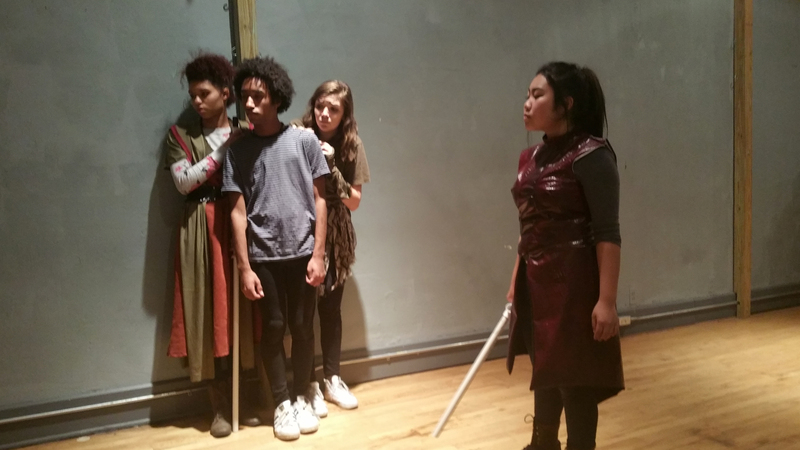 The cast of She Kills Monsters marvelously tells the story of a young girl who uses a role-playing game to live out the parts of her life she wishes were different. Agnes (Morgen Chang) seeks the help of a local dungeon master, Chuck (Justin Betancourt), to explain the book written by her late sister, Tilly (Mindy Vang). Betancourt’s hilarious portrayal of Chuck is spot-on for a stereotypical DM, and Chang and Vang perfectly display the rapport expected between sisters with a large age gap. Add believable supporting characters, amusing puppetry, great costuming, and superb stage combat, and you have the makings of an entertaining yet emotional performance. I appreciate the fact that I had no idea what the overall message of the play was going to be until I experienced it myself. If it’s possible for you to attend without knowing any spoilers, I recommend it. Dragon props for She Kills Monsters. Gadfly made great use of a small space at the Fox Egg Gallery. There are not a ton of seats, so if you plan to attend, get your tickets early. You may also want to leave the little ones with a sitter, since this show does have some adult humor and language. I brought along my 12-year-old and his friend, and they both thoroughly enjoyed the show—in fact, the minute it was over, my son asked to see it again. She Kills Monsters runs through October 16th at the Fox Egg Gallery in Minneapolis. More information and tickets can be found on the Gadfly Theatre Productions website or Facebook page. This play sounds so fun! Too bad I won’t be around, but hopefully it will be back again!